Meet Cheato! 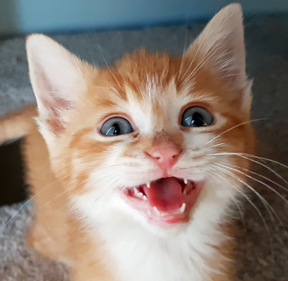 This little ginger is ready to be the center of your universe. You've never met a kitten as happy and loving as this little guy. If you look at him from across the room he will start to purr and meow until you come give him attention. He gives hugs, kisses and the strongest head butts you've ever had from a cat! But don't let this little lovebug deceive you - he also plays like a little lion. His favorite toy is a mouse that he will run around with, growling and wrestling. This little guy packs a lot of personality - come meet him today!